We are having a relax on our last afternoon before getting into the work of cleaning up the apartment and packing our bags. We plan to get up at 07:00 tomorrow, shower quickly, and go for the airport to be there by 09:00. Our morning started waking with an alarm at 08:00, to stay in the habit of getting up a bit earlier rather than sleeping in until 10:00. After breakfast Weetabix, we went out and walked west along Rue de Rivoli, because M. wanted to get a hot chocolate from Cafe Verlet, where I'd got the really non-sweet one the other day. Alas it was closed, so we kept walking until we found an open cafe and went in to sit at a table. It's obvious how the cafes make their money here. My chocolat chaud cost €6 and M.'s cappuccino €7. A beer only cost €5.50! But I didn't really feel like a beer was a good way to start the day. The chocolate was nice, if milky (nothing will ever compare to the delight we had in Venice), and M. said her cappuccino, which came in a tall glass, was good. While we were sitting there, a tour bus pulled up outside the cafe and some middle aged American ladies were staring out at us, gawking at the sight of a couple of people having coffee in a cafe in Paris. A couple of them actually waved at me, so I waved back, and then one mimed the act of drinking from a cup while grinning maniacally at us. So we waved and drank while they watched and probably made their day. A minute later an old, small beetle-like car with a roll-top sunroof stopped at the lights. It had a number 38 painted on the side in a white circle. The driver looked French and had a couple of tourists in the back. We figured it was a guy hired to drive tourists around and show them Paris for a day, which would be a cool way to do things if you had the money for it. It would also potentially be a fun and interesting job for the driver. 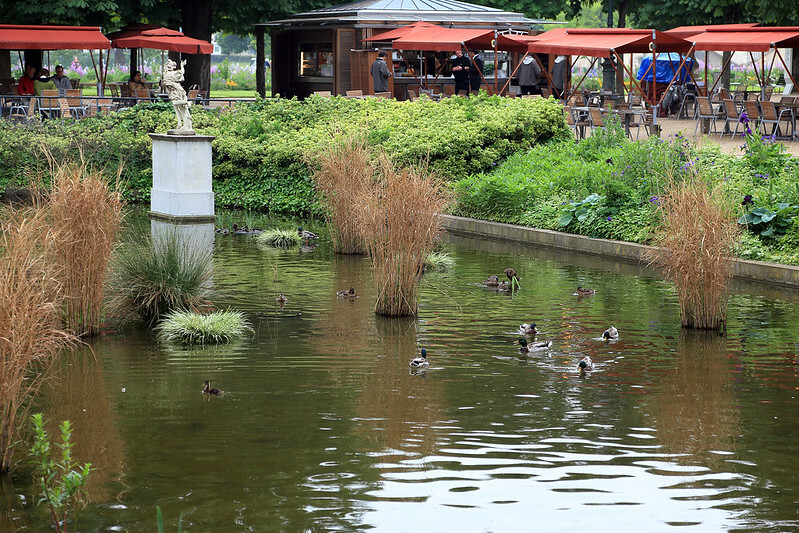 We left the cafe and walked over to the Jardins de Tuileries, which we hadn't really seen properly yet. This is a vast garden-park stretching from the Louvre to Place de la Concorde, at the end of the Champs-Élysées where we'd seen the obelisk earlier. It's very nicely laid out and maintained, with wide walking paths between rows of carefully trimmed trees, and flowers and lawns beneath. There's a large fountain in the centre and we noticed a lot of movable garden chairs arrayed around it and also shattered around the rest of the gardens in small clumps. The chairs must be for people to move around and sit where they like in the gardens, which is a fantastic idea that might not work anywhere else as they would end up stolen within a few hours. At this early hour on a Sunday, the park was mostly empty except for several joggers, the odd walker, and some tourists. Two young American women passed us and stopped to take photos. One said, pointing: "Get me in front of that building." The other replied, "The one with the chimneys?" The first one said, "Yeah, or whatever they are." I was thinking: "You mean, the Louvre?" As we walked across the gardens it started to rain. M. put the large Rome umbrella up, but I managed to stay dry by walking under the rows of trees. 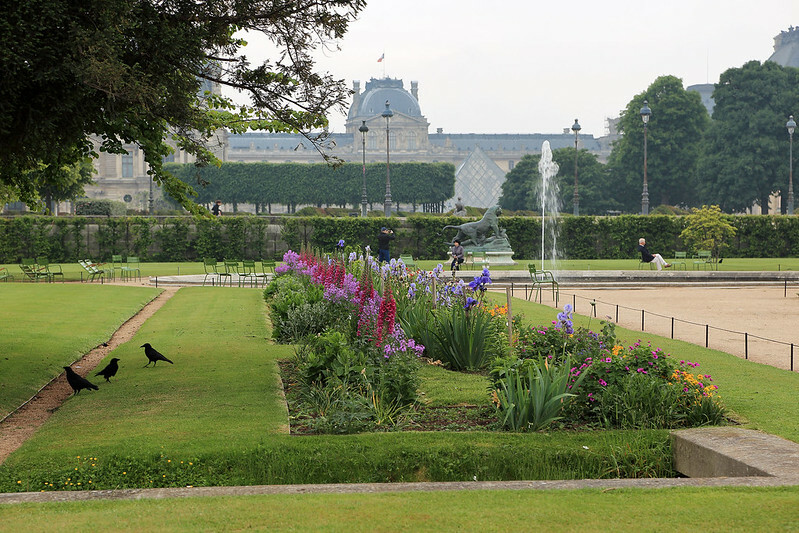 Their dense foliage kept almost all the rain off, until we had to emerge from cover to walk the final hundred metres or so to the entrance of the Musée de l'Orangerie, in the western corner of the gardens. This small museum was actually partly designed by Claude Monet himself, who helped convert the previously existing building into an art gallery specifically to display two enormous cycles of his water lily paintings in the round in two large elliptical rooms on the upper floor. The entire floor is taken up by these rooms and they make an astonishing presentation of the great painter's work. The first room contains bright, colourful canvases of the pond by day, or at least sunset, with reflections of clouds and trees in the water beneath the lilies. The second room contains a cycle of paintings with a darker palette, and with willow tree trunks and dangling fronds of leaves in the foreground in front of the water. These could be night or twilight scenes. 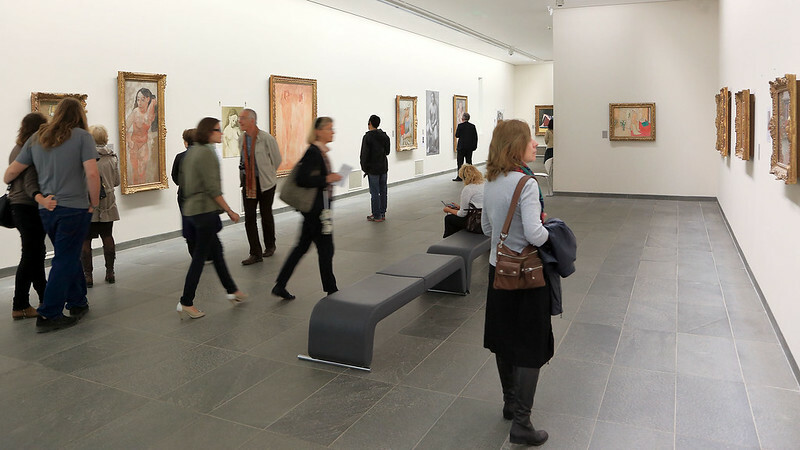 Downstairs was a gallery of other Impressionist artwork, with works by Renoir, Sisley, Manet, Cézanne, some early Picassos, and others. 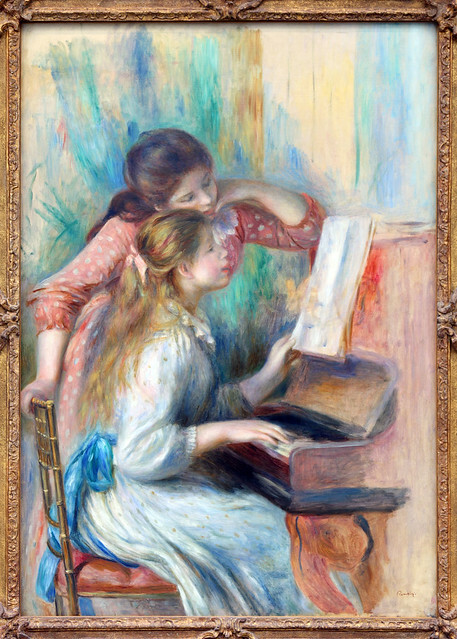 There was also a special temporary exhibit on the composer Claude Debussy, with portraits of him and family members by some of the Impressionists, plus works that influenced Debussy and his musical compositions. It also included some manuscripts of music Debussy had written. Overall it is a small museum and we went through it all in about two hours, but well worth the admission. On the way out we naturally checked the gift shop and found the Monet Rubik's cubes here for €11, €1.50 cheaper than at Giverny, so I bought two, one for myself and one as a gift for Paul. I also bought a Monet Concentration memory game, which I imagine will be fun trying to remember and match a bunch of similar paintings. M. found a printed bag which was exactly the sort of thing she looked for but couldn't find at Giverny, so got that. When we emerged, the rain had stopped and the clouds broken up. We wanted to walk over to the Shakespeare & Company book shop again to buy a copy of The Hunchback of Notre Dame, since it seemed like a good souvenir, with the shop being within sight of the great cathedral and all. To get there we crossed the Seine on the nearest bridge, the Passerelle Léopold-Sédar-Senghor, which happened to be a pedestrian bridge with thin metal cables forming a safety barrier between the deck and the railings. 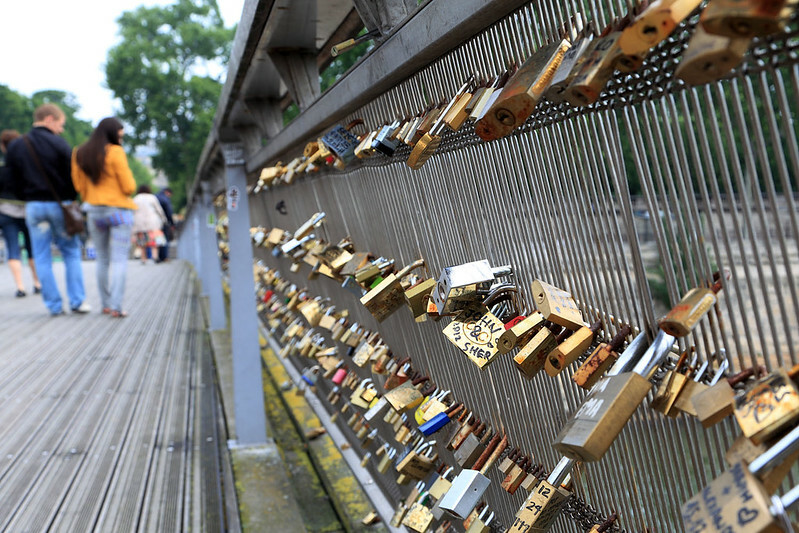 These evidently attracted lovers to affix padlocks onto them as tokens of their love, as there were thousands upon thousands of them attached to the bridge around these cables. Most of them had names written on them with permanent markers, but some were engraved, and some elaborately so. Further east we saw another pedestrian bridge with probably even more padlocks attached to it. 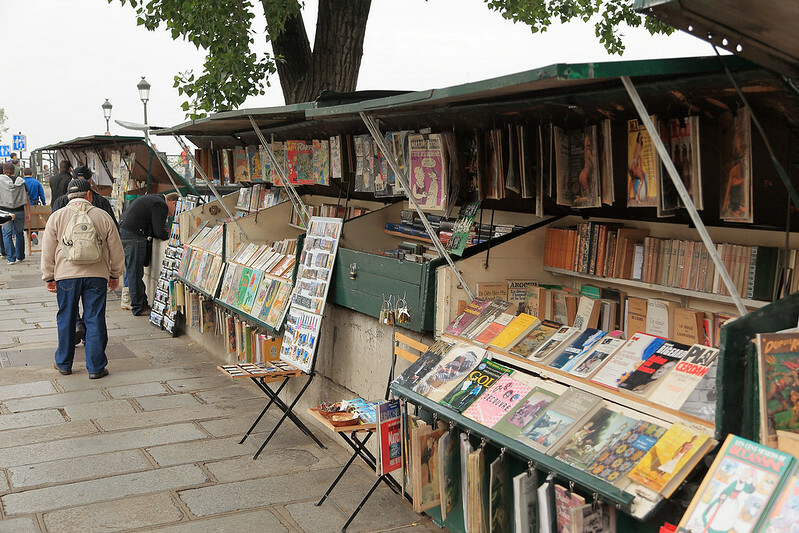 Walking along the Quai (the street along the river bank), we passed dozens of small stalls selling antique books, cards, posters, and so on. These were green wooden boxes bolted to the stone wall, which evidently held the stall-holders' stock when locked up, and which folded open into a covered stall displaying the wares when the owner arrived to unlock them. These stalls had an amazing array of stuff, including things like magazines from the 1940s, and we even saw one that had newspapers from the 1880s! And these were just little anonymous stalls on the street, not some high class antique shop. Some of the stalls also sold padlocks, for €5 a pop. We figured they must buy them by the crateful and make something like €4.50 profit on each one. We also saw the same car number 38 that we'd seen earlier while having coffee, driving on this side of the river now. At the Shakespeare & Company book shop we went in and M. went straight to the table where she'd seen a stack of copies of The Hunchback of Notre Dame on Tuesday, only now there were none there. We looked around and finally spied several stacks of the book up on a high shelf, higher than I could reach. Not seeing any others anywhere, we asked for assistance and the cashier pointed us at a spot on a nearby shelf. There was one copy there and the cover was badly crushed, so we requested another copy. The cashier called another woman over to help us. She said, "oh there's loads of them just over... oh, they're all gone." She grabbed a ladder and brought down about two dozen copies from another high shelf we hadn't seen before and placed huge two stacks on the counter right by the cash register. We guessed they must sell a lot of copies of this particular book. M. paid for one and got it stamped with the famous Shakespeare stamp, making a great keepsake for us. From there we walked across to Île de la Cité and the front of Notre Dame, where the Fête du Pain was in full swing on its last day. Several stalls were selling food, and I bought a baguette from one for us to munch on for lunch. It cost €1.50 and was still warm as we cracked it open. We went into the bustling main marquee to see what the crowd there was watching. 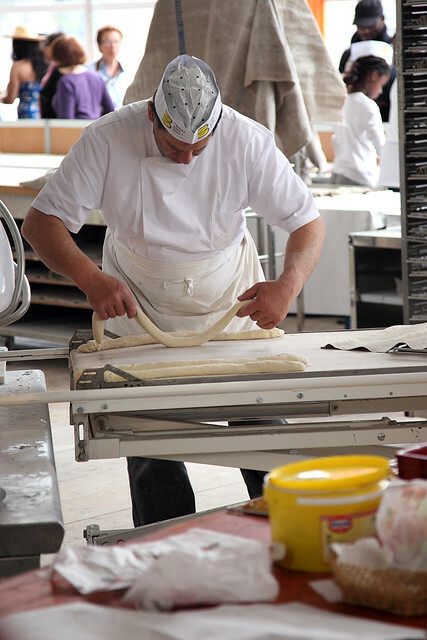 We saw several bakers inside making bread, kneading dough, rolling it out, cutting it and forming it into various shapes for baking. The crowd was thick and it was tough to get close enough to see the action. We got free samples of a yellow product that was a cakey sort of sweet bread, but we didn't see any sign of the world's longest baguette anywhere, alas. Finishing off our own baguette, we walked the short way home to drop off our purchases from the morning. Then we set off again, catching the Metro to Bastille so we could pop into Kristyn's place and drop off the koala we'd brought with us as a gift for hosting us in Paris. On the walk from Bastille station we saw some brioche in a patisserie and decided to try that because we hadn't had any brioche since we'd arrived in France. It was okay, not as good as some brioche I've had back home in Sydney. Ah well. I dropped off the koala and found a note left for us by Kristyn, thanking us. Then we turned back and walked past the Bastille monument and to the west into Le Marais district. Before leaving Bastille though, we ran across a street market which turned out to be the Marché Bastille on Boulevarde Richard Lenoir. This was interesting, with stalls similar to the Art market near the Louvre, including another nougat stall with even bigger giant rounds of nougat than the other market. 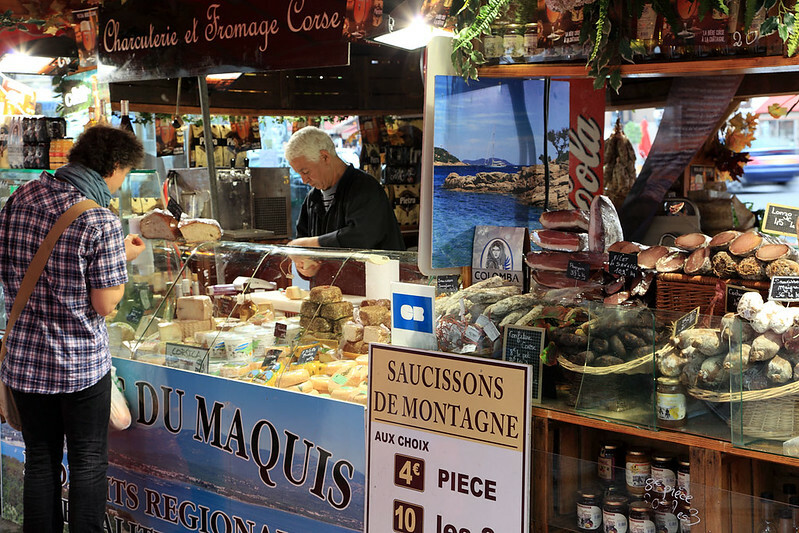 I took some photos of a charcuterier with hams and sausages and cheeses on display, than took a photo of the market in general with a stall of leather bound journals in the foreground. The stall owner looked at me accusingly and started saying, "Did you take a photo of my stall? Did you take a photo of my stall?" in English. I stood my ground and replied that I was taking photos of the whole market. The guy came over to me, patted me on the shoulder, and with a big smile said, "Ah, it's okay, you can take photos!" I think the whole thing was a bit of an act and he was just joking around to see if he could get a reaction. We walked west along the main street into Le Marais, but it didn't look all that interesting. At some point we decided to turn north into a side street, and thus we came across Rue des Rosiers, which ran parallel to the main road west. Here was definitely where the action was! It was buzzing with people, strolling, eating food, and with shops and food stalls all over the place selling interesting and exotic stuff. Many places were clearly Jewish and there were Middle Eastern things sprinkled through as well, with people lining up thirty or forty deep to queue for take-away falafel rolls or shawerma. The sights and sounds and smells were all sense-tingling. A bit further along we came across a group of eight men playing instruments and singing together. 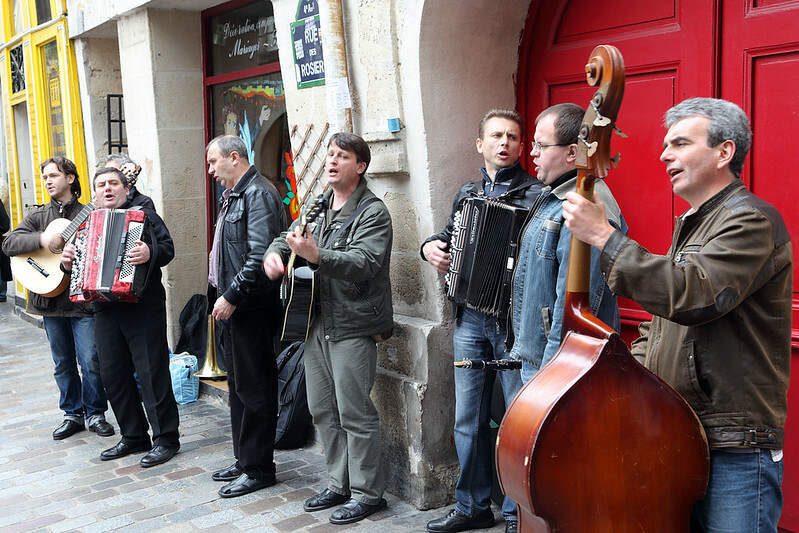 We recognised it as the same group we'd seen busking underground in the Metro interchange tunnels at Châtelet a couple of times. The sang a deep barbershop quartet style of harmony with what sounded like Russian or other Slavic rhythms and words, and they were very good. A large crowd was gathered around appreciating their performance. Rue des Rosiers ended all too soon unfortunately and we continued walking the rest of the way home, not finding anything else as entertaining and interesting as that. We'd come home early, around 15:30, to give us time to relax and start packing our luggage before heading out for our last dinner in Paris. I hopped in the shower, then wrote some diary, organised my luggage a bit, and changed for dinner. M. organised her things and read some of her novel. For dinner we'd reserved a table (via the restaurant web site) for 19:30 at Ozo, a place Kristyn recommended for good vegetarian-friendly food. We'd wanted to try Maceo, but unfortunately they didn't open on Sundays, so we slipped to this choice. As it turned out, we weren't disappointed. Ozo is a sort of concept restaurant, in which you choose your meat and your sauce separately from mix and match lists. This presumably outrages traditional French chefs, who wouldn't stand for the diner getting to choose what sauce they want to go with what meat. After picking those, you add two or three vegetable side dishes (for different prices) of your choice from a list of five cold dishes and four hot ones. For the vegetarian option, you can simply pick four or five of the sides. Before all of this though, there was the cocktail list. They had a slew of standard cocktails and long drinks, plus a list of "creations", which were unique to the restaurant. M. chose a glass of rosé wine from Provence, but I had to try a creation, choosing the "Wandez-vous". Which I didn't realise was a pun on "rendezvous" until the waitress repeated the name back to me. It contained Cointreau, syrup of violets, fizzy water, and something else. When it arrived, it turned out to be a pastel purple cocktail with silver balls floating in it, like some sort of fantastic bubble tea! As I had a sip, M. said, "Does that feel like a man's drink?" I answered, "Not really." She said, "I mean a French man's drink?" Ah, possibly. At the table outside the window where we were sitting was a man at a table with three women. Their drinks arrived, with the women getting dark red concoctions and the man getting a pale purple wandez-vous. The menu contained meats including chicken, pork, veal, duck, rump steak, and beef fillet, as well as salmon, cod, scallops, or baby calamari. I felt like red meat and the fillet was more expensive than the steak, so I chose that, since this was an "occasion" dinner. 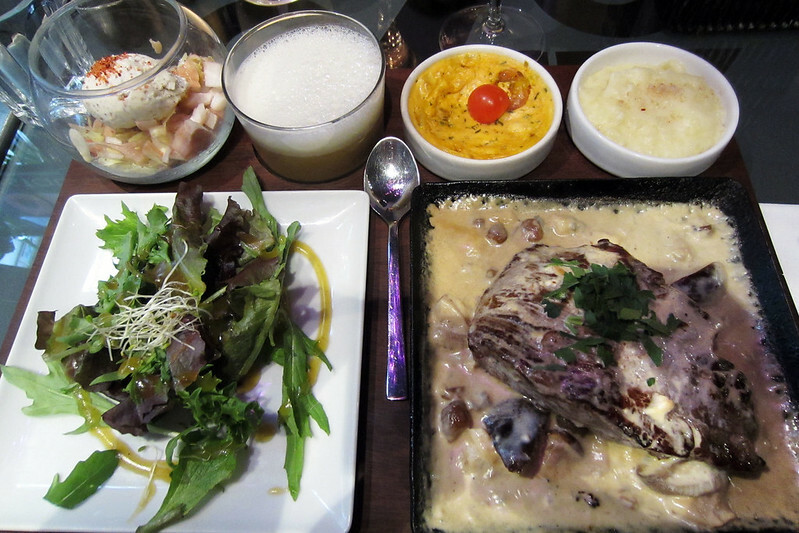 The sauces included intriguing variations on béarnaise, teriyaki, a mango sauce, a coconut curry, a few other wildly different things that I don't remember, and the one I ordered, which was blue cheese with wild mushrooms and raisins. For my sides I got a pear salad with mustard ice cream; pumpkin soup; and cherry tomato and feta tart. The meal also came with mashed potato and a mesclun salad with mango dressing. M. had soba noodles with peanuts; zucchini with goat cheese; cucumber gazpacho with sunflower seeds; beetroot dip with pistachios; and a mixed melon salad with mint; plus the mashed potato and mesclun salad. After finishing my cocktail I also ordered a glass of red wine, choosing something from Bourgogne from the list, since its description sounded the most hearty to go with the beef and blue cheese. And here we had another different selection of table condiments, with no mustard, but both red and green Tabasco sauce. The food was amazing. I had all of the pumpkin soup first, which was creamy and a bit spicy and had a layer of some sort of foam on top. Then I tried the mustard ice cream, which was placed on top of the pear salad and had a sprinkle of red and white crystals on top which turned out to be a chili powder and sugar. This was a really strange but intriguing mixture of flavours that somehow all worked together. Really interesting and good. The tomato and feta tart was less unusual. The mashed potatoes were different though, with a mix of really creamy mash and some deliberate large lumps of potato to give it some texture, topped with a sprinkle of salt. The beef fillet was very good, but the sauce was exceptional. We even asked for more bread when our basket was empty, so I could mop up all of the sauce with bread when the meat was gone. 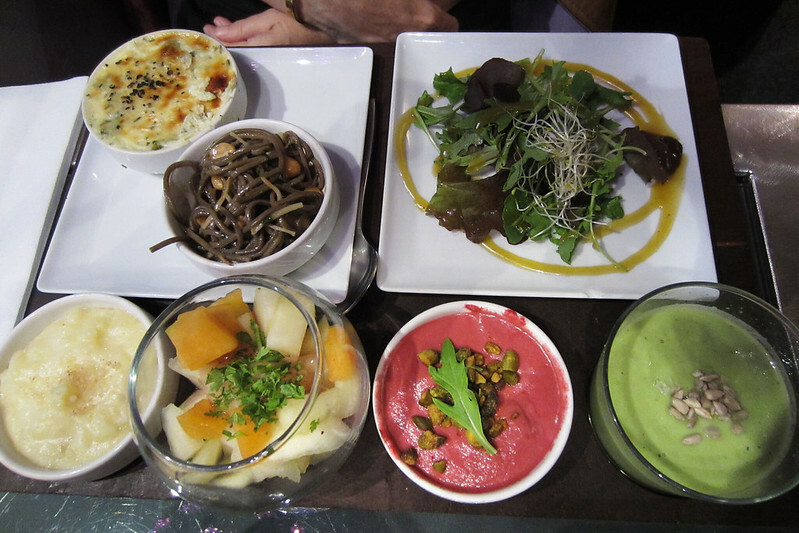 M. really liked her soba noodles, beetroot dip (which used up a lot of our first basket of bread), and melons. She said the zucchini was merely good, and the cucumber gazpacho passable, but it had a little bit of chili in it which gave it a spicy aftertaste that she didn't like so much (so I finished that off). After this culinary journey, I couldn't possibly overlook dessert. I was hoping the dessert menu would follow the theme and you would get to choose a dessert platter made of three or four different choices from the list, but alas it was a simple "choose one" affair. 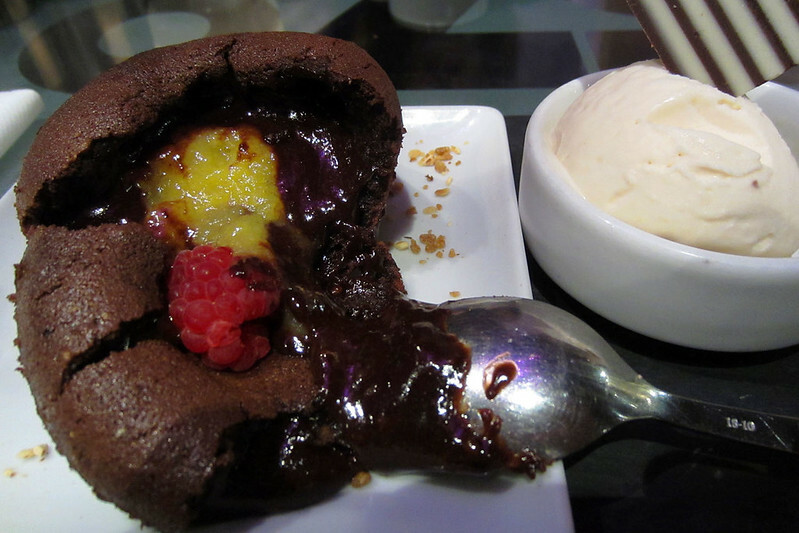 I selected the chocolate fondant and orange peel cake with apricot yoghurt ice cream, while M. had a cafe crême to keep me company. The cake was superb, rivalled only by the chocolate sausage dessert Tony and I had back in Venice. M. and I agreed this was easily one of the best meals of the entire trip, and a worthy way to end our time in Paris. We discussed how much this incredible dinner would cost us, figuring it had to be substantially over the hundred euro mark. We called for the bill, and it came to €78.50. We walked home in a light rain, M. with the small umbrella and me just huddled under my jacket. The rain made the streets slick and glistening, reflecting the lights of the Paris twilight on a magical final day in the city. Last updated: Wednesday, 19 July, 2017; 01:20:50 PDT.